The “1917: The One Hundredth Anniversary of the Russian Revolution” exhibit in one of the large windows separating the Library from Holy Grounds commemorates this world-changing event. Designed by Joanne Quinn, graphic designer and Communications and Marketing team leader, the exhibit was mounted by Kallie Stahl, team member. 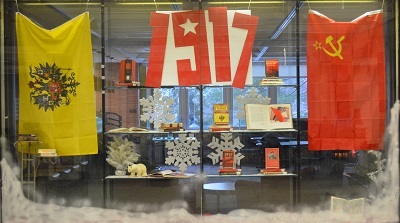 In addition to a large “1917” sign flanked by two flags, the exhibit includes a small collection of books about Russia, large snowflakes, two trees and a small bear, all set in a snowy background. On the left is the large, colorful flag of Imperial Russia (from 1895-1917) with its intricate designs; on the right the flag of Soviet Russia, with a yellow sickle, hammer and star on a red background. Books, all drawn from Falvey’s collection, cover various topics such as art, the 1917 revolution and other history, and fiction, all related to Russia. This colorful exhibit serves as a precursor to a much larger exhibit which will be mounted in February. This exhibit is now closed, but the much larger Russian exhibit will soon arrive and will fill the various cases on the first floor. 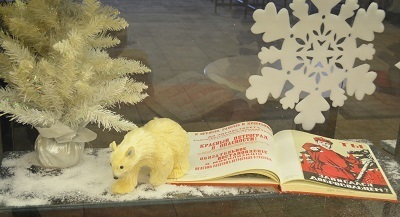 Photographs by Alice Bampton, Communication and Marketing Dept.